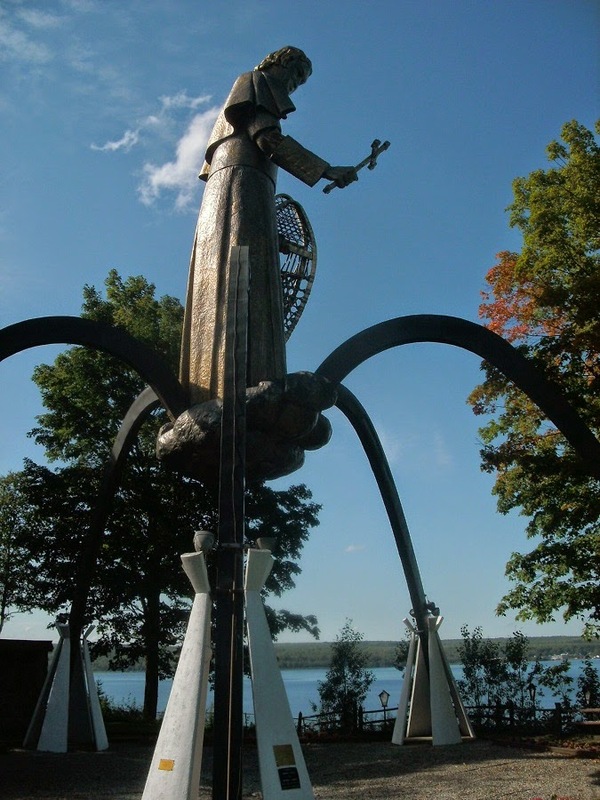 If you’ve never visited the Bishop Baraga Shrine, the next time you’re in the vicinity of L’Anse, Michigan, give it a try. It is right off U.S. Highway 41, just past Erickson’s True Value Hardware and the CertainTeed ceiling plant, if you’re traveling north. Turn left at the shrine’s funky tepee sign, cross the tracks, go up the dirt road and turn right. A bit down that road turn right again, into the shrine’s parking lot. If you’re traveling south on 41, after you’ve had your root beer float at The Drive-In and have rounded the foot of the bay and are going uphill, just look for the funky shrine sign on your right. If you somehow miss it, you can turn around at the hardware store. It’s best to go when the shrine’s gift shop is open. The nuns are very nice—they even let dogs come in, or at least they did with Josie and Finn. In the gift shop, you can explore the saints and maybe get a taste of fresh, homemade ice cream. 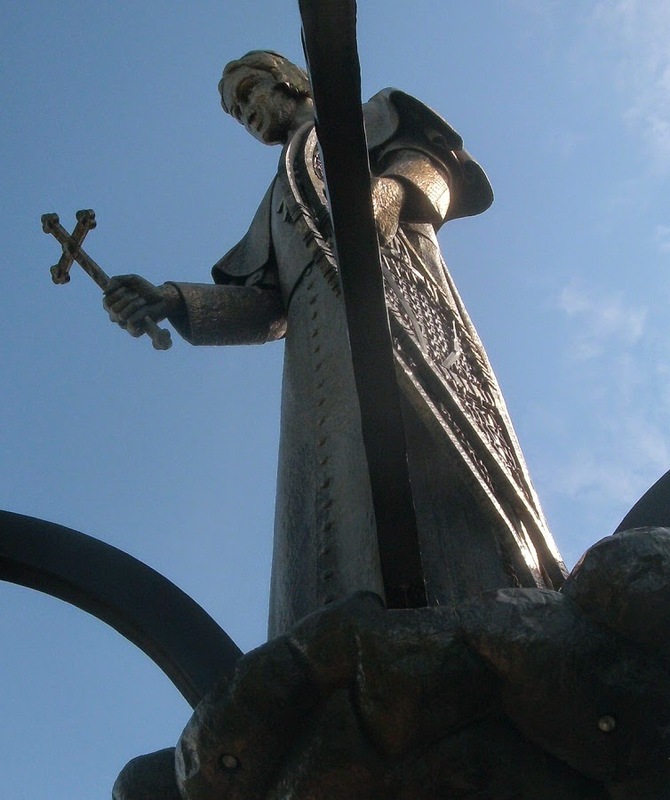 But, even if the shop is closed, stop and see Bishop Baraga, the Snowshoe Priest, sculpted from four tons of copper standing on a cloud of stainless steel atop a bluff overlooking Keweenaw Bay. It’s a pretty nice view. In a week or ten days or maybe two weeks I will be leaving the Upper Peninsula, heading to California in the van with Josie, Elliott, and a couple hundred pounds of beeswax. We’ll be there then on the west coast for a while, no doubt through the winter, and this time I mean it. I hear that near where I will be staying there is an arcade with a carousel—a merry-go-round. I am looking forward to getting on a painted pony and going ’round and ’round to the sound of some tinny, maybe calliope, music. The other night when the sun was beyond the trees that line the river and the sky above the trees was a clear, pale blue-grey, there was above that a ripple of cloud stretched out like a gauze strip preparing to land but caught in mid-air. It was all lit up peachy orange. I might have taken a picture, but the sky and the cloud and the colors were as if already a picture, only not so flat, not so trimmed, not so stationary, and I wanted to leave it that way, exactly as it was.